If you are experiencing painful muscle spasms on your back, neck, shoulders, and hips – you may be suffering from fibromyalgia. This chronic condition usually targets the brain which mostly impacts a person’s focus or concentration and accompanied by fatigue, pain, and sleeplessness. Around 2% to 10% of people have fibromyalgia. One of the most common tell-tale signs of fibromyalgia is insomnia. Patients with this medical condition usually have difficulty falling asleep or tend to wake up a lot of times and reaches a certain point wherein they can’t achieve deep REM sleep. What Causes Fibromyalgia and How to Deal with it? There are around 10 million people in the United States suffering from Fibromyalgia. Despite being one of the most common chronic pain conditions in the world, there is still no consensus about what causes it. However, according to researchers, there are several factors contributing together to increase the risk of Fibromyalgia, other than a single cause. Genetics – Due to the fact that Fibromyalgia tends to run in families, researchers have suggested that genetics may play a small part in it. Associated Conditions – Some rheumatic conditions where they affect the patient’s bones, muscles, and joints are found associated with Fibromyalgia. When diagnosing Fibromyalgia, these conditions will be tested. Some of them are: rheumatoid arthritis, osteoarthritis, etc. Physical or Emotional Stress – Fibromyalgia can be triggered by not only physical but also emotional trauma. Illnesses, Infections, injuries, birth giving, etc. Losing a loved one, an abusive relationship, experiencing relationship breakdowns. etc. Changes in levels of certain hormones in the brain – dopamine, serotonin, cortisol, and noradrenaline. These hormones are important when it comes to the regulation of your behavior, sleep, mood, response to stressful events, etc. Changes to Chemicals in the Nervous System – Brain, spinal cord, and nerves. The central nervous system is responsible for transmitting information (including pain messages) around your body through a network. Abnormal messages may result in constant and extreme sensitivity to pain. Sleep Issues – Sleep problems are not only symptoms but also causes of fibromyalgia. People who suffer from this condition find themselves in the midst of a vicious circle. Fibromyalgia causes pain and fatigue all over your body, preventing you from getting a good sleep. Fibromyalgia patients who experience sleep problems / disrupted sleep can suffer from higher levels of pain. 2. How to deal with Fibromyalgia? Medicines – The most important and vital treatment is to get help from a doctor or a physical therapist. Exercise on a Regular Basis – Exercises stretch your muscles and provide pain relief. Improve Your Sleep – Get enough quality sleep! Getting too much sleep can lead to broken sleep patterns. Healthy Lifestyle – Regulates your routine, including eating, going to sleep, etc. Relaxation Therapies – Help promote a better sleep experience. There is a link between body pain and sleep deprivation. Fibromyalgia is no joke but a good choice of mattress can bring about ultimate comfort and restful sleep, without tossing and turning. Battling this debilitating illness is challenging but you can beat the odds by increasing your resistance and defense levels. A good sleep has powerful health benefits and can give you a boost towards healing. Your choice will solely depend on your medical condition and personal sleep preferences. Choose a model that will help you increase your chances of healing and gaining your life back from the stress of fibromyalgia. 1. Latex, Innerspring or Memory Foam? The recommended types of models for fibromyalgia can be anything from latex, innerspring, or memory foam, which are all beneficial to fibromyalgia sufferers. Latex is definitely a good option as it promotes good airflow, breathable, and is hypoallergenic which is recommended especially because fibromyalgia patients tend to experience overheating when asleep. More so, the right amount of responsiveness, bounce, and that soft cushiony feel proves to be latex’ edge among other types of foam. Memory foam is really popular now. It can either be made of all-natural or polyurethane memory foam which conforms to the body while cushioning the spine and the rest of the body. This is recommended to fibromyalgia patients because it combines the comfort and support that you look for. A cooling gel type of memory foam can be a plus factor for those who tend to sleep hot. You can also opt for the new generation of hybrid innerspring models that now have comfort and support layers or foam, latex, or a combination of materials. Choosing a higher spring count will also give optimum support for your head, neck, and spine. Choose a model that relieves pressure on painful pressure points and can distribute weight evenly to provide comfort when you sleep. The ideal level or firmness for alleviating back pain in fibromyalgia patients is that of medium-firm. Fibromyalgia patients will need a mattress that provides comfort to alleviate pain, while also being firm enough to support the body, especially the heavier parts of it. The Layla is great for those suffering from fibromyalgia due to its innovative use of copper, as well as its ability to change firmness options by flipping it over. It is copper-infused with anti-inflammatory properties and for cooling which is ideal for those fibromyalgia patients who tend to sleep hot. It also has ThermoGEL properties which also enhances its cooling capacity. The Layla has the flexibility and the right balance of comfort and support which is great for providing cushioning and contour as well as overall support for the body. All of these features make the Layla a great option for those suffering from fibromyalgia and is highly recommended for helping alleviate the symptoms of this uncomfortable health condition. Get the full Layla mattress review. The Voila is a hybrid model that is available in Plush, Medium, and Firm options to suit your sleeping style and requirements especially for fibromyalgia patients. It provides good support regardless of sleeping position. It is also very responsive and made of a thick comfort layer which is very soft yet firm enough to provide that cushioning element to remedy back pain and other joint pains. It adapts to your body and has a good amount of push-back. Needless to say, its cooling features are remarkable and above average compared to other brands in the market. The combination of the gel top layer and latex did a great job with providing a cool and comfortable sleep. It has a good amount of sinkage and won’t make you feel stuck which is recommended for people suffering from fibromyalgia who are looking for the equal doses of comfort and support. Get the full Voila mattress review. 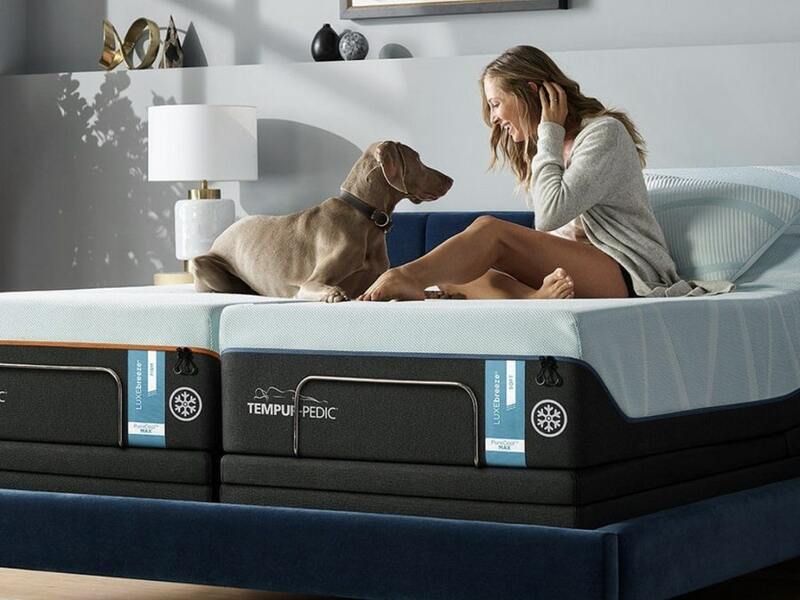 The new, updated version of the Tempur Cloud Luxe Breeze provides you with that classic memory foam feel with the plush support of TEMPUR material that is very responsive and conforms to your body movements and shape. It also adapts to your body temperature and helps dissipate heat when necessary to achieve a cool sleep. The Cloud Luxe Breeze comes with excellent motion isolation that will leave you undisturbed even with a partner that moves about during the night or you yourself getting in and out of the bed all night or trying to achieve a state of comfort, when often uncomfortable. The Tempurpedic Cloud Luxe Breeze is an all foam mattress that provides adjustable support needed on your head and back. The excellent edge support is ideal for people that suffer from fibromyalgia and who want a durable and sturdy model that can grow with them and their changing needs. And the fact that you can now order Tempur Pedic mattresses online and save up to 30% makes it even better! Get the full TEMPUR-PEDIC mattress review. I have intense chronic pain and we got the Tempurpedic Contour which is way too firm. We slept on it for the 90 days we had to break it in before the cut off to exchange it. now I am deciding between the hybrid and the cloud! and if the breeze is really worth the extra $1500! Help! Yes it is definitely worth the extra money. Hybrids are firm as well, i would go with an all foam bed, and the Cloud Luxe Breeze is MUCH softer and more comfortable.